Meet the love child of two of my favorite things- cozy sweaters and affordable Amazon prime finds. Yes! Affordable Amazon Prime Sweaters. When stocking my Fall closets, sweaters can be one of the priciest things to purchase. 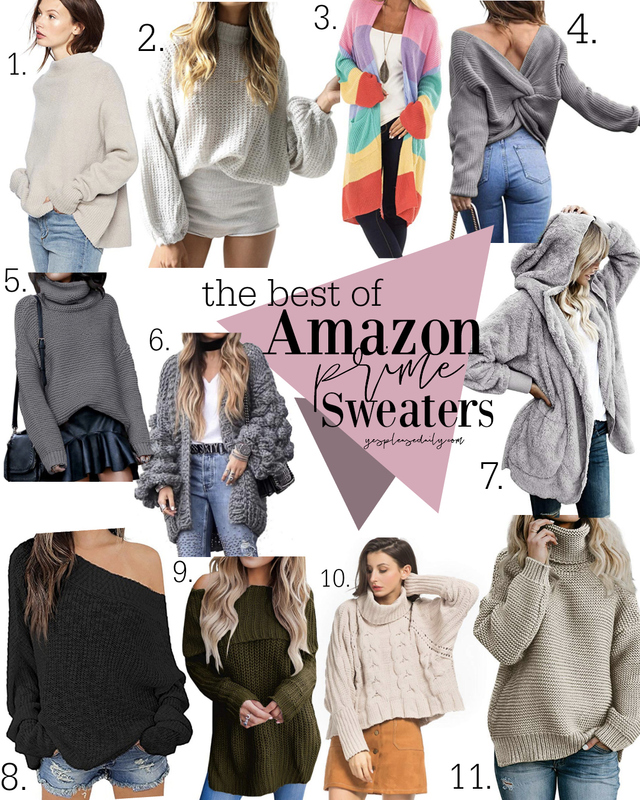 Like almost anything I order, I always check Amazon first and almost every style sweater is available on Prime! After loading my cart up with favorites, I decided I needed to share the best Amazon Prime Sweaters with you guys too! When ordering clothes from Amazon, especially things that are more budget friendly, I always size up. I like sweaters to be chunky and cozy, so even if it is a little big, I like it that way! 2. Casual Long Sleeve Loose Knit Pullover, $25, 3 Colors. This is one size, but I think it fits like a Large. It is short but not cropped, just not long enough to wear with leggings. I LOVE this sweater and think I’m going to order the black too. 3. Knitted Rainbow Colorblock Cardigan, $31. 4. Casual V Neck Criss Cross Back Sweater, $20, 13 Colors. 5. High Neck Long Sleeve Pullover, $29, 8 Colors. 6. Bubble Long Sleeve Chunky Cardigan, $60, 10 Colors. Ordering this today! 7. Open Front Hooded Cardigan, $24, 10 Colors. 8. Off the Shoulder Batwing Sleeve, $25, 5 Colors. 9. Off the Shoulder Sweater, $25, 8 Colors. 10. High Neck Chunky Sweater, $37, 5 Colors. 11. Casual Turtleneck Sweater, $30, 3 Colors. This is the perfect everyday sweater. I sized up to a Large for a cozy fit and I love it. I need to know what to add to my next order! I live for my next Amazon package ha! I will be doing a September Favorites Round Up soon, so be sure to check back. If you order any of these Amazon Prime Sweaters, you have to let me know! Share on Instagram with the tag #OhYesPlz. XO & Happy Friday! I’ve been obsessed with the green color option of your #5 sweater pic for over a year! I’ve seen it several sketchy websites and listed on Amazon but so i was afraid to buy clothes online from an unknown seller and get burned. BUT! I used your link and finally ordered the sweater and it’s amazing! I LOVE it! The color, the fit, everything is perfect.